Update. Unfortunately, as of April 2012, Bits and Druthers is currently closed due to the closing of the East Side Food Court, and is not expected to reopen. My visit to Bits and Druthers was part of the Central TX BBQ Run. 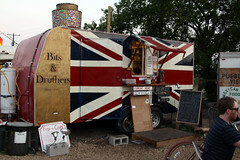 My second course from the “Eastside Drivein” collection of food carts was from Bits and Druthers, a Union-Jack-painted trailer sporting a menu that was essentially fish and chips, and permutations thereof. 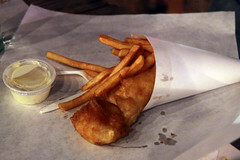 I’m always a little bit skeptical of fish and chips joints, since my many travels (especially in England, which is pretty much the birthplace of fish and chips) have shown me that there’s generally a sort of “Fish and Chips Exclusion Principle” at work: Places that have good fish generally have lousy chips, and places that have good chips generally have lousy fish. Places that can do both well at the same time are actually quite rare. There’s some real food science between it as well. To get both the batter and a fairly thick slab of fish fried correctly, you typically need to fry the fish at pretty much exactly 350 degrees, and pull it out before it’s done cooking through so that the temperature can even out through the fish (“coast up”) as it’s resting. Meanwhile, the generally-accepted best way to cook chips so that they are soft throughout the inside, and crisp on the outside, is to fry them twice, first par-cooking them (many fast food places have the step done beforehand, and the par-cooked fries frozen) at a relatively low temperature like 325 degrees, and then re-cooking them at a higher temperature (like 400) to crisp them up. All said and done, that means to run a good fish and chip operation, you’ve got to either keep three separate oil cookers going (it’s useful to always have at least two anyways, so that your chips don’t end up tasting like fish), have some seriously good kitchen management going, or have someone really good working the Frialator. To tell you the truth, I couldn’t tell you which approach Bits and Druthers was using, since you can only see a small sliver of their kitchen through the tiny service window on the side of the trailer, but whatever it is they are doing in there, they’ve got it dialed in. The chips came out with the perfect texture, a nice fluffy and creamy interior, blanketed in a thoroughly crispy, thick, slightly-darker-than-golden brown crunchy exterior that’s I’ve grown to crave from my fries ever since those trips to Belgium and the Netherlands. These were spot-on perfect, and nicely complemented with a mild curry gravy. The fish? A nice, substantial slab of haddock (I’m always thankful when my fish and chips joints actually identify the fish they are frying, doubly so when they use a good fish like haddock instead of some bland cod), that was probably the most perfectly deep-fried piece of fish I’ve ever had. Cooked through with a nice, soft white texture and no translucency, the fish was still thoroughly juicy, not over- or under-cooked, tender, and had just enough salt to season it properly. 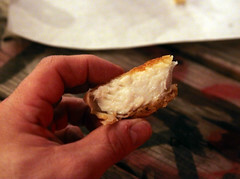 The breading was also perfectly light and crispy, adhered well to the fish, and didn’t have the greasy overtones you usually get from breading. In short, this was perfection. The only possible downside to Bits and Druthers is that I didn’t really care for their tartar sauce, finding it a bit bland. But the fish itself was so good, I’m not sure it needed any. It certainly didn’t need it for flavor or moisture. Overall, Bits and Druthers got my attention. I wasn’t expecting to have some of the best fish and chips of my life from a little trailer in a dirt lot on the eastern side of Austin, but that’s what I got. Of the many food carts and BBQ joints I tried this trip in Austin, Bits and Druthers is near the top of the list for a repeat visit.